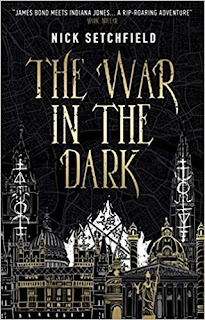 The term "genre-defying" gets tossed around a lot, but I have never read a book that it fits better than The War in the Dark by Nick Setchfield. 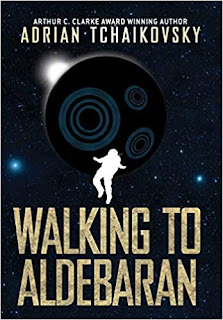 This is a book with elements of supernatural horror, urban fantasy, and historical adventure that reads like an old-fashioned spy thriller, but with the contemporary sensibilities of a conspiracy thriller. It's tense, unsettling, and altogether fascinating. 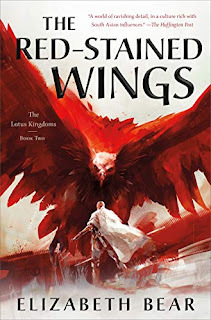 This was a solid read that I devoured over the course of a few nights, so I really want to focus on what worked, but I do need to call out its only real flaw. As well-developed as the mystery, the history, and the mythology is, the characters are rather thin. They lack personality, and don't really garner any sort of emotional attachment in the reader. I liked Karina's darkness and duplicity, and thought the Widow was fantastically creepy, but Winter was more a POV character than a true protagonist. Now, with that out of the way, let me say a few words about the show-stopping moments here. The book starts slowly, weaving an interesting tale of espionage and murder that seems far removed from the cover blurb . . . until the scene at the church, with the priest who dissolves into a wriggling mass of insects. The maddening chase through impossible hallways and cursed rooms, ending in murder and betrayal, is visually stunning. The introduction of the Widow into the story is, for me, one of the coolest things to happen in the book, a scene of dark magic that literally explodes off the page. I was not expecting the ghost (I won't say of whom, for fear of spoilers), but that small scene brings a much-needed bit of dark humor and wonder to the tale. As far as pivotal moments of exposition go, the whole scene in the tower is fantastic, not just illuminating the overall mystery, but propelling the entire story into its final act. 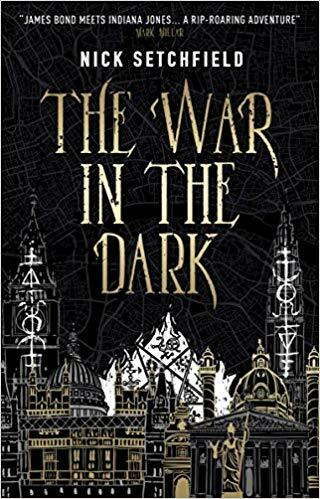 The War in the Dark is, not surprisingly, an unrelentingly dark book. It's a book of death, betrayal, curses, and secrets, where the murder of a spouse is one of the least shocking aspects. 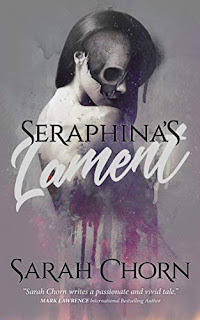 Setchfield builds up the supernatural elements to the point where I worried the climax would fall short, but the story ends strong, with a few surprises, tying everything together. It might be a little cold and emotionless for some readers, but it's worth taking the chance. This sounds awesome! Looking forward to starting it. This sounds so good - I'd not heard of it but then saw your comments on twitter. I've added it to my wishlist thanks.